Michael Tröbs in the lab. 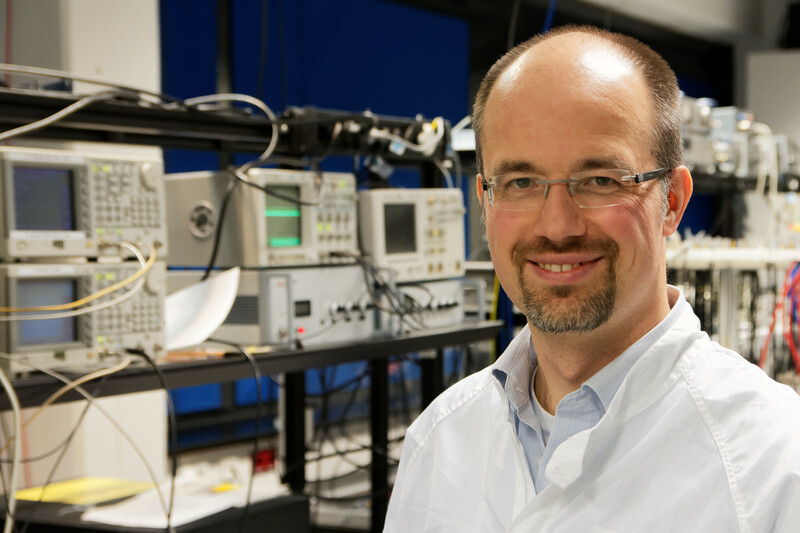 Michael Tröbs is an experimental physicist at Max Planck Institute for Gravitational Physics (AEI). The LISA optical bench test bed was built in collaboration with Airbus DS and University of Glasgow. At AEI Michael is responsible for the project. A testbed to experimentally investigate tilt-to-length coupling for LISA, a gravitational-wave detector in space. The planned space-based gravitational-wave detector LISA will consist of three satellites in a triangle with million kilometer long laser arms. This constellation will orbit the Sun, following the Earth. LISA is expected to be laser shot-noise limited in its most sensitive frequency band (in the Millihertz range). The second largest contribution to the noise budget is the coupling from laser beam tilt to the interferometric length measurement, which we will call tilt-to-length (TTL) coupling in the following. How does tilt-to-length coupling come about? In their orbit around the Sun, the LISA satellites follow test masses, cubes made of a platinum-gold alloy free-floating inside the spacecraft. These test masses define the lengths of the interferometer arms. The satellites shield the test masses from outer forces such as solar wind or solar radiation pressure. The spacecraft interferometrically measure their position and orientation relative to the test masses and center and align themselves around them using micro-Newton thrusters. In addition, distance and orientation are measured between satellites. These two measurements are combined in post processing to synthesize a Michelson interferometer. The interferometer for the test mass position readout is called test mass interferometer and the interferometer for the distance measurement between satellites is called science interferometer. Distance changes between each satellite and its test mass and between the other (remote) satellites are measured by an instrument called the optical bench. Since it is rigidly attached to its satellite and the test mass is not, the laser beam probing the test mass will vary in angle. Similarly, the laser beams exchanged between optical benches on different satellites will change their respective angles. These changes in beam angles lead to a relatively large change in the interferometric length readout. What can be done to reduce tilt-to-length coupling? A tilt of the satellite relative to the test mass or the received beam leads to beam walk on the photodiodes in both the test mass and the science interferometer: the beam does not hit the center of the photodiode but is laterally offset. This beam walk causes geometric tilt-to-length coupling – the path travelled to the photodiode gets longer when the beam is tilted. Imaging systems in front of the interferometer photodiodes keep the beam centered on the photodiode and reduce beam walk and the geometric coupling. We plan to experimentally verify that tilt-to-length coupling can be reduced to acceptable levels in a setup representative for LISA. 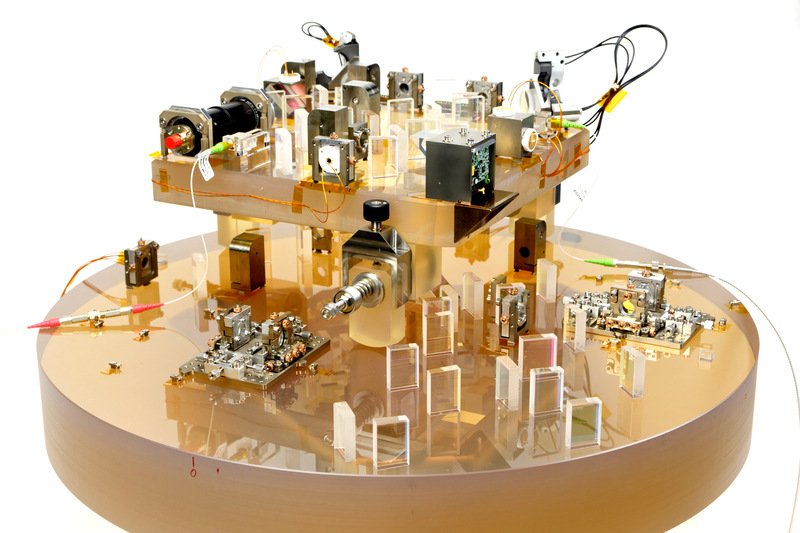 We have built a prototype optical bench for the mission, that does not perform all functions of a LISA optical bench but only those required now: a measurement interferometer, in which a local beam is interfered with either a beam from a remote spacecraft or a beam that is reflected off a test mass. This optical bench was built by our colleagues at the Institute for Gravitational Research in Glasgow. 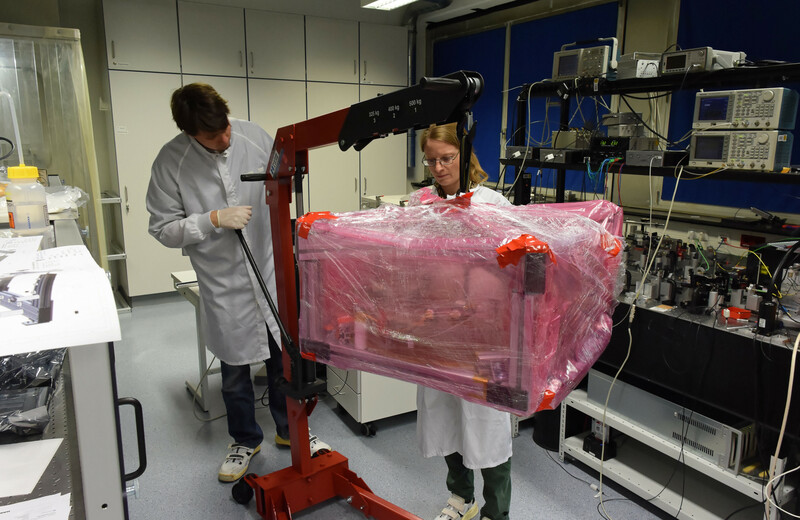 Figure 1 shows Maike Lieser and Sönke Schuster unpacking the prototype – I was very impressed when I first laid eyes on the real thing: 55 kg of Zerodur in a disk with a diameter of 580 mm and optical components placed with micrometer precision on it. Figure 2 shows the test bed with the telescope simulator placed on top of the optical bench. Now that we had the optical bench – how to test it? We built another optical assembly that generates a tilting beam and provides a reference interferometer to measure against. We called this assembly the telescope simulator. It mimics the beam received on the optical bench from a remote LISA spacecraft, a laser beam with flat intensity and flat phase distributions. In addition it can also generate a Gaussian beam used to probe the test mass. We had to make sure that tilt-to-length coupling does not happen in the reference interferometer. To achieve this we placed the reference photodiode in a location equivalent to the center of rotation of the beam. This gets rid of the geometric tilt-to-length coupling. There are additional sources of tilt-to-length coupling, e.g., a mismatch in wavefront curvatures or the intensity profiles of the laser beams. To get rid of those we used a small photodiode, which – when placed in the center of beam rotation – is not affected by these other contributions. Differences in wavefront curvatures for example vanish with a sufficiently small photodiode. The same holds for beam intensity variations. If you want to know more about the LISA optical bench test bed, read our recent publication on CQG. It also details two designs for imaging systems that can be investigated with the test bed. This entry was posted in Author Insights, IOPselect and tagged gravitational wave detectors, gravitational waves by David Jones. Bookmark the permalink.